It looks like a typical wristband at first glance. However, unlike others, this wristband will alert you when there is any incoming call. Yes, it is another product by BQ Wireless called BlueQ Bluetooth Wristband. BlueQ wristband will give you a vibrating heads-up on incoming calls. This unique invention sports a minimalist design with only two buttons (with blue and red LEDs) – one to turn the wristband on and off, while the other is for the ‘transfer’ feature. The ‘transfer’ function will allow users to answer calls from their phone. Many people might be wondering why they need a vibrating alert via their wristband. It is an unnecessary item to them. Having said that, the idea of BlueQ is to alert people who keep their mobile phones elsewhere when there is an incoming call. Furthermore, it is also a fashionable gadget for people especially youngsters. 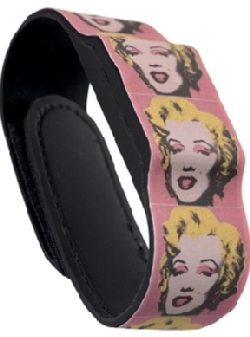 Fashion enthusiasts can customize the wristband’s skin by uploading their favorite image into a template provided to create the skin.